When rock stars reach immortality, their fellow musicians honor them with tribute albums. When structural engineers reach immortality, their colleagues present them with a volume of research papers celebrating the breadth of their research. Such was the gift presented to Sidney A. Guralnick, Perlstein Distinguished Professor of Engineering, upon his 70th birthday. A group of former students, research collaborators and colleagues came together to write papers on topics related to his research. The publication, Engineering Science of Structures, celebrates the accomplishments he made in structural engineering. Foregoing a promising career as a pianist to follow his dream of becoming an engineer, Guralnick enrolled at Drexel University, where he earned a bachelor’s degree in civil engineering. He enrolled in Drexel’s five-year co-op program, spending two quarters in the classroom and two quarters working each year. He held jobs with the Philadelphia Electric Company in the engineering test and evaluation department, with a subcontractor doing stone, tile, slate and terrazzo work, and with Atlantic Refining Corporation (now ARCO). 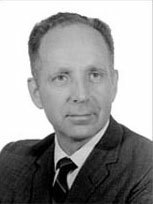 In 1952, Guralnick was appointed as an instructor and manager of the structural engineering research laboratory at Cornell University, which enabled him to pursue graduate studies there. As a graduate student, he managed several large research projects on reinforced concrete structures and light-gage steel structures and also taught courses in concrete structures, steel structures, and the analysis of statically determinate and indeterminate structures. After earning his Ph.D. in 1958, he became an assistant professor of civil engineering at Cornell, but soon decided it was time to move to Chicago, which was an important center for the practice of structural engineering. Heather Bilandic, former IIT Trustee, and Guralnick at the ribbon cutting ceremony for Morton Park. When Guralnick left Cornell to become an assistant professor at IIT, blueprints were still drawn by hand and Ludwig Mies van der Rohe’s final two buildings had recently been finished: S.R. Crown Hall (1956) and Siegel Hall (1957). Guralnick became actively involved with campus life at IIT early in his career. He served as chairman of the faculty council in 1961 and as the first chairman of the newly created faculty senate in 1962. In 1965, he served as one of the organizers of the World Congress on Engineering Education, held in the then brand-new Hermann Hall. He brought in a traveling Shakespeare company to perform on campus numerous times and set up a weekly lecture schedule in the 1960s and 1970s. 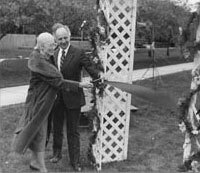 In 1975, IIT President Thomas Martin appointed Guralnick, who was then dean of the Graduate School, as the University’s first provost. He also served as executive vice president and was a member of the IIT Board of Trustees. Throughout these years, his strong work ethic and sound policies had a significant influence in shaping the university. Of his years as provost, Guralnick says, “One of the things that helped with that responsibility was the fact that I like to solve problems. As provost, I was involved with a number of interesting problems that I was able to solve simply because I have the kind of mind that enables me to work through challenges without a lot of emotion.” During his first five years in that position, undergraduate enrollment increased by 40 percent and his effective recruitment of a number of outstanding new faculty members caused the annual research volume to more than double. As both provost and as a professor, Guralnick’s primary commitment has always been to the students, helping them achieve the success for which IIT’s graduates are known. In 1989, he was awarded IIT’s and Armour College’s Excellence in Teaching Awards. Guralnick presents Benny Goodman with an alumni recognition award. Guralnick’s dedication to IIT led him to raise millions of dollars for the university and the Civil and Architectural Engineering (CAE) department’s program. His fundraising efforts helped establish the Pritzker Institute of Biomedical Engineering and the Chicago Health and Medical Careers program. His dedication to building and modernizing the CAE labs has resulted in an impressive array of machinery for studying models of structures and structural materials. These machines range in cost from a few hundred dollars to more than the price of some new homes. When touring the CAE labs he helped modernize, Guralnick leans against a universal testing machine able to exert 800,000 pounds of force and discusses the basics of his research on metal fatigue, a subject that has puzzled researchers for 150 years. In the late 1990s, he developed a system that is able to detect highway pavement deficiencies while traveling at 50 miles per hour. He is clearly a man who loves his work, and it shows whether he’s speaking about research or the $12 million he raised as provost, part of which funded the prize-winning Minorities in Engineering program, which enabled IIT to graduate more African-American engineers in the 1980s than all the Big Ten schools combined. In his wide-ranging career, Guralnick has often given lectures on his research in the United States, Peru, and Switzerland. In addition, he has given general-interest lectures on Roman engineering achievements and the building of the Gothic cathedrals of Europe. In the future he plans to devote more time to exploring these fascinating topics. At the conclusion of a lunch reception and lecture in Guralnick’s honor in April, former student and long-time friend William Lavicka, (BS CE ’67), presented a $10,000 check toward an endowment to be named for Guralnick that will honor excellence in faculty and student work in Civil and Architectural Engineering. The gift and the many contributions made by John McLaughlin, (BS CE ’58, MS CE ’70), William Nash, (BS CE ’44), and others to aid in laboratory development are fitting tributes to an educator, researcher, and university leader who has left a lasting legacy at IIT as well as in the structural engineering world.